As the world looks back on Robin Williams' life, it’s remembering some of the esteemed actor’s greatest contributions to humanity, which often had little to do with the big screen. Williams, who died in an apparent suicide on Monday, was staunchly committed to a number of social justice issues, but paid particularly close attention to the plight of homeless people. But it was a stern (and, of course, at times funny) testimony he gave to Congress in 1990 that’s now making the rounds again, which conveyed the depths to which he went to try and put an end to homelessness. "Homelessness is not irreversible," the late actor said. "With politics and moral commitment, a massive increase in affordable housing, and the types of social services that are envisioned in the act, homelessness can and should be eliminated." During a two-hour hearing, which was chaired by Edward Kennedy, the "Mork and Mindy" star urged Congress to support the Homelessness Prevention and Community Revitalization Act, which called for more affordable housing, among other measures. A related bill was passed into law later that year, according to the National Journal. While the actor appeared nervous at times during his testimony, he didn’t hesitate to slam anyone who took the crisis lightly. Williams said there were between 2 and 3 million homeless people in the United States at that time, and he argued with President Ronald Reagan’s notion that people on the streets had simply chosen that way of life. But Williams urged Congress to look beyond such short-term "Band-Aid" efforts and to actually find long-term solutions to end homelessness. Together with Whoopi Goldberg and Billy Crystal, the Academy Award-winning actor helped raise more than $80 million for Comic Relief, a nonprofit that donates 100 percent of its proceeds to help homeless people in need throughout the U.S.
Harrah's Entertainment, Inc. COO Tim Wilmott (C) donates $250,000 on behalf of the Harrah's Foundation to Comic Relief 2006 show hosts, actor/comedians (L-R) Whoopi Goldberg, Robin Williams, Billy Crystal, and Comic Relief founder Bob Zmuda at The Colosseum at Caesars Palace November 18, 2006 in Las Vegas, Nevada. During the hearing, he spoke about the scores of "smart, responsive and articulate" kids he met through Comic Relief who had recently become homeless, and how their lives of these children -- "our future" -- were in jeopardy because of their lack of housing. It’s a sentiment that eerily holds true more than 20 years later. While homelessness dropped for the third year in a row in 2013, according to the Housing and Urban Development Department, the fact remains that more than 610,000 people live on the streets mostly because there is a lack of low-income housing. More than 12.8 percent of the nation’s supply of low-income housing has been permanently lost since 2001, according to the National Law Center on Homelessness & Poverty (NLCHP). And federally subsidized housing often has years-long wait lists, Maria Foscarinis, NLCHP executive director, told USA Today. And anti-homelessness laws, which have proven to be costly and ineffective, are on the rise, the same organization found in a recent study. Study after study has proven that giving homeless people housing not only save lives, but is actually cheaper than doing nothing. “When you’re homeless, you are dependent on everybody,” Carl Caldwell, a resident of Moore Place -- which is a Charlotte, N.C., apartment complex that houses 85 chronically homeless adults -- told HuffPost in March. "Now I am independent and can give back." 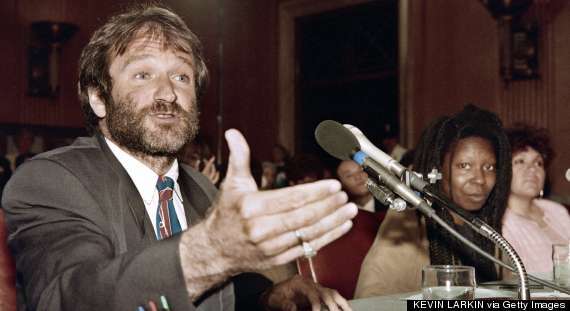 Learn more about how you can continue Robin Williams' efforts to help homeless people by getting involved with Comic Relief. Find out more here.